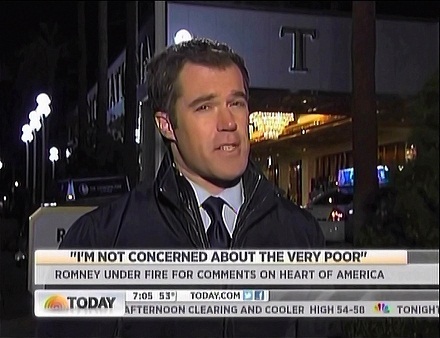 Sounding like an Obama campaign spokesman on Thursday's NBC Today, correspondent Peter Alexander touted how a recent gaffe by Mitt Romney was "not the first time...Remember that he said corporations are people, or there was the $10,000 bet during the debate." Alexander proclaimed it to be, "just one more item that could go on to the president's re-election campaign team's greatest hits reel against Romney." At the top of the broadcast, co-host Ann Curry hyped: "GOP frontrunner Mitt Romney deals with a backlash to this controversial comment." The edited sound bite that followed ignored the full context of Romney's remark: "I'm not concerned about the very poor, we have a safety net there." Later, Alexander's report featured a longer clip: "I'm not concerned about the very poor. We have a safety net there, if it needs repair, I'll fix it. I'm not concerned about the very rich, they're doing just fine. I'm concerned about the very heart of America." In an effort to pile on, Alexander highlighted Romney being confronted by gay activists as another "distraction" for his campaign: "He was greeted in Minnesota by a pair of glitter bombs from gay rights protesters." ALEXANDER: Back here on the trail, frontrunner Mitt Romney stumbled out of the gate of staging his Las Vegas arrival. MITT ROMNEY: I'm so happy to be back in Nevada. ALEXANDER: Romney and his team are now in damage control mode after this comment Wednesday that unleashed a firestorm of criticism. ROMNEY: I'm not concerned about the very poor. We have a safety net there, if it needs repair, I'll fix it. I'm not concerned about the very rich, they're doing just fine. I'm concerned about the very heart of America. ALEXANDER: Opponents and detractors pounced, with conservative websites lashing out. Including one headline that read, "What's Wrong With This Guy?" On his flight to Vegas, Romney quickly tried to explain himself. ROMNEY: You've got to take the whole sentence, alright, as opposed to saying and then changing it just a little bit, because then it sounds very different. GINGRICH: I am fed up with politicians in either party dividing Americans against each other. I am running to be the president of all the American people and I am concerned about all of the American people. ALEXANDER: It wasn't Romney's only distraction of the day. He was greeted in Minnesota by a pair of glitter bombs from gay rights protesters. ROMNEY: I'm happy for a little celebration. This is confetti. We just won Florida! We're just going to win the White House next! ALEXANDER: And as for those gaffes, it's not the first time for Mitt Romney. Remember that he said corporations are people, or there was the $10,000 bet during the debate. And that's part of the problem, just one more item that could go on to the president's re-election campaign team's greatest hits reel against Romney. And it's one more thing that has conservatives, today Matt, scratching their heads. LAUER: Alright, Peter Alexander in Las Vegas this morning. Peter thanks so much.